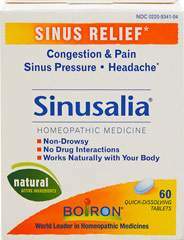 Sinusalia temporarily relieves nasal congestion, sinus pain and headache due to the common cold or allergies*. It does not cause drowsiness. Sinusalia also has no known drug interactions with other medications. Recommended for everyone ages 6 and up, Sinusalia is available in a box of 60 quick-dissolving tablets.